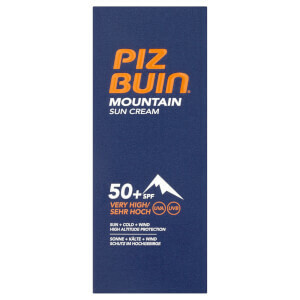 The Piz Buin Glacier Cream High SPF30 is the brands latest sun cream innovation for tackling adverse winter climates where skin needs maximum protection, inspired by the very first launch in 1946. The unique, water-free formula instantly forms a protective barrier across skin with an advanced UVA and UVB sun filter system, offering photostable protection to prevent sunburn, long-term damage and radiation. Enriched with Glycerin, the balm infuses skin with moisture, helping to alleviate feelings of tightness and discomfort while preventing extreme winter dryness. Tested in Norway, one of the coldest countries in the world, the powerful sun cream provides superior protection from high altitude sun, cold and wind while leaving skin feeling soft and soothed. Perfect for winter sports. Apply generously before sun exposure. Full face application = 1 teaspoon. Reapply frequently, especially after sweating. Avoid midday sun. Designed for use in cold temperatures. [PR-011080], Petrolatum, Paraffinum Liquidum, Octocrylene, Dimethicone, Dicaprylyl Carbonate, Ethylhexyl Salicylate, Cera Microcristallina, Diethylamino Hydroxybenzoyl Hexyl Benzoate, Glyceryl Stearate, Bis-Ethylhexyloxyphenol Methoxyphenyl Triazine, Glyceryl Behenate, Titanium Dioxide (Nano), Silica, Hydrogenated Castor Oil, Hydrogenated Styrene/Isoprene Copolymer, Caprylic/Capric Triglyceride, Aluminum Hydroxide, Stearic Acid, Tocopherol, Parfum.